As the popularity of aftermarket kerb-view windows rises, Transport for London (TfL) has provided further guidance as to the circumstances under which they can be taken into account when assessing a vehicle’s Direct Vision Standard (DVS) star rating. Kerb-view windows are installed under the main windows on the nearside door of truck cabs. They provide drivers with a crucial view of an area immediately adjacent to the nearside front wheel, and can be used to spot cyclists which may have slipped unnoticed up between the truck and the kerb. Some truck manufacturers, including Scania, Volvo and Renault, now offer these as factory-fitted options on smaller urban distribution cabs – but many operators are now also fitting windows produced by the aftermarket to new and existing trucks of all types. However, there had been some confusion as to whether these fitments could be taken into account when the direct and indirect vision from an individual truck is assessed for access to London. TfL has directed truck operators to individual truck manufacturers to discover the star ratings for their vehicle. Trucks with factory standard kerb-view windows have them taken into account when the star rating is allocated, and generally enjoy a better rating than the equivalent truck without. The star ratings themselves have been established by computer modelling at Loughborough University, with the size and shape of windows and the height at which the cab is mounted above the road both being factors that have to be taken into consideration. However, windows fitted by the aftermarket are not automatically taken into account, requiring approval to be sought from the truck’s original equipment manufacturer (OEM). In response to questions from Tony Rodwell at aftermarket manufacturer Truck Door Windows, TfL has offered further clarification surrounding the consideration of retrofitted kerb-view windows within DVS. The approval process requires OEMs to provide computer aided design (CAD) data for the field of view of the particular window. The window supplier needs to submit the technical details and method of fitment to the relevant OEM, and the OEM needs to conduct a technical appraisal of the submission and provide documented approval of the modified truck. TfL also reiterated that, as low-level passenger door windows are a direct vision measure, they may be included in the DVS rating, but are excluded from the HGV Safety Permit scheme, which comprises a range of indirect vision measures for vehicles that do not meet the minimum DVS rating. 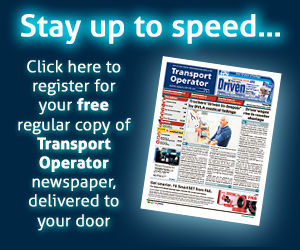 Mr Rodwell contends that growing numbers of operators are now ordering the retrofit kerb-view window products, irrespective of whether their trucks are operating in London or not, indicating that they are of practical benefit to truck drivers and other road users. Astra Vehicle Technologies, the provider of the Astra ClearView low level window product – which was initially developed for and in combination with DAF sales engineering in the UK – also spoke to Transport Operator. “More than 1,200 Astra ClearView installations have been completed, driven not by DVS guidelines but primarily by the desire of responsible fleet operators, to pursue best possible practice for direct vision with the cab designs that are available today, irrespective of the political mandate,” said the company. The firm continued: “It should be noted that the vehicle manufacturers’ factory fitted options are currently only available for the smaller cab variants. No major OEM has a factory-fitted window solution on the larger height vehicle sizes around which the primary blind spot concerns exist. TfL is planning further consultation on the DVS in January next year; but meanwhile, it appears that UN regulations on ‘blind spot information systems’ (BSIS) are likely to be formally adopted in March. These will make the fitment of such systems compulsory on new vehicles of over 3.5 tonnes gross weight first registered from October 2019. The BSIS would need to be capable of informing the driver of nearby cyclists who may be in danger during a potential turning manoeuvre, and providing a warning via optical, acoustic or haptic signals of increased collision risk. A spokesperson for the Freight Transport Association said they welcomed the UN regulation. “A global standard is what’s required, not individual cities creating their own regulation. “The FTA always had serious concerns about London going it alone, and those concerns have proved well-founded. “We’d like to see London abandon its standards and accept the UN standards, but politically, we fear that ship has sailed.